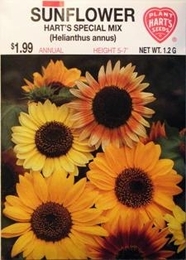 This mixture produces a wide variety of different colors and sizes of sunflowers on tall plants. Plants make ideal borders suitable for cutting. Sunflowers are among the easiest kinds to grow, ideal for children.